The Shenandoah Half Marathon had been mildly on my radar for about six months because it popped up whenever my running friends liked the page on Facebook, but I wasn’t familiar with the National Parks Half Marathon Race Series until doing a little research into finding a race in either southern Utah or near the Grand Tetons, two places Bill and I would like to return to visit. 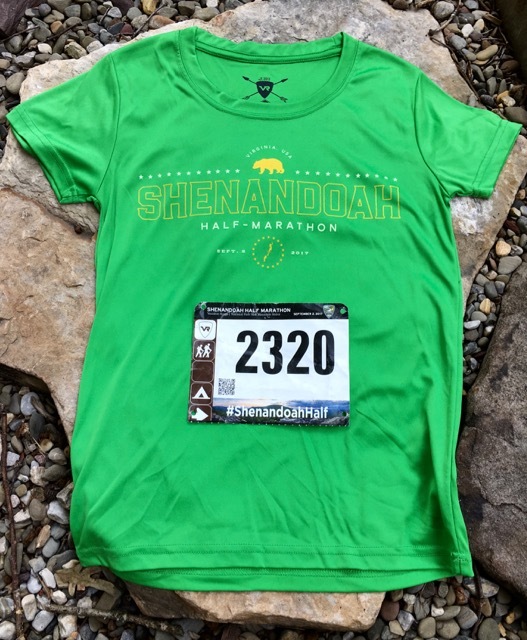 As I finalized my fall training plan, I realized that the Shenandoah Half would fit nicely into my schedule and decided to add it to my fall racing calendar. 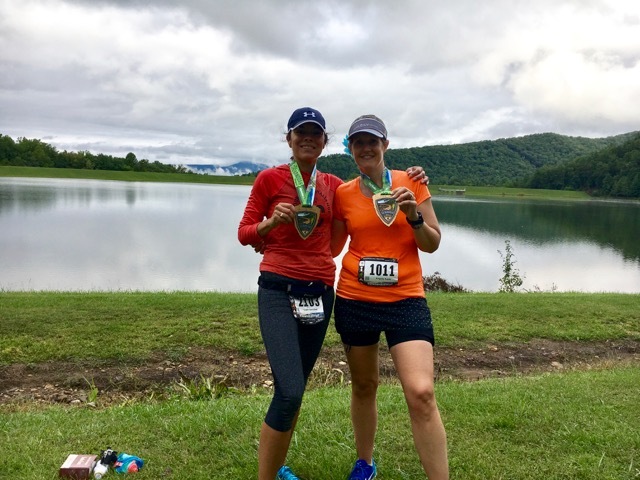 Originally, I’d planned for it to be a little getaway weekend for Bill and me, but when I learned that my friends Lupe and Angela were planning to run the race, I decided to join them for a girls overnight race trip. 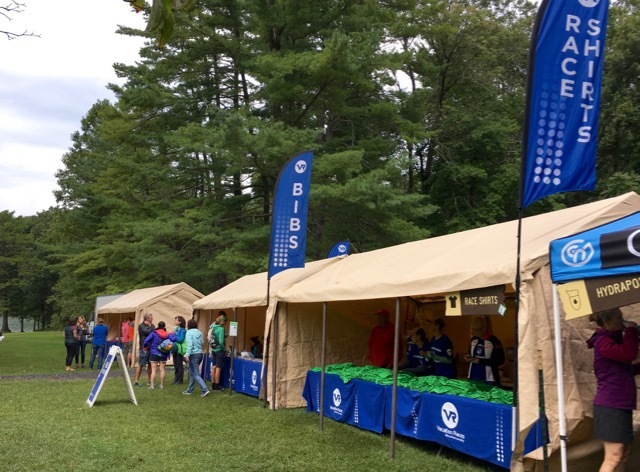 We left home early Friday afternoon of Labor Day weekend for the sub two-hour drive to Luray, VA. We drove straight to packet pickup before checking into our hotel. 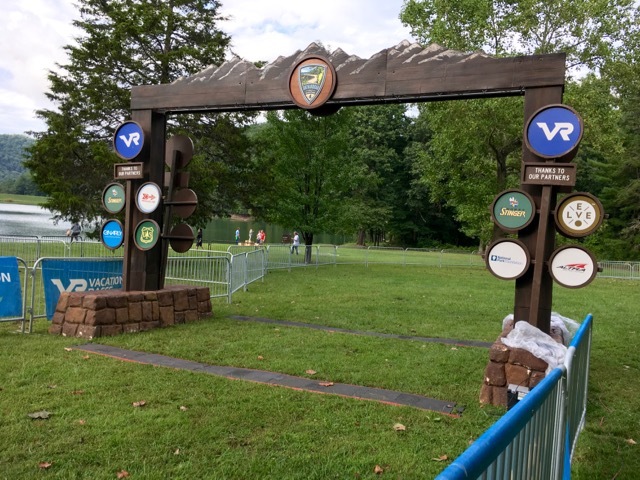 Packet pickup was outdoors in the park where the race would finish the following morning. Angela had paid the fee to have her packet mailed to her, but Lupe and I still needed to pick up our bibs and shirts. We got our bibs easy peasy and Lupe got her shirt, but I had registered too late to get mine. I was told to stop by after the race the following day and could get one after all the runners who had registered six weeks prior to the race had gotten theirs (I had only registered one week earlier). I was disappointed and afraid that I might not get the size I wanted, but all ended well when they had plenty of size small left the following day (I almost forgot to pick it up, though). I love the light weight fabric that the shirt is made with, and of course I love the women’s cut and slightly lower neckline. 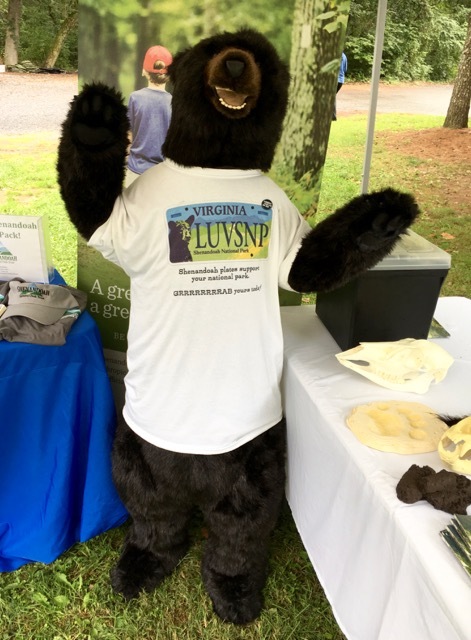 While milling around the race expo, I saw Smokey the Bear advertising Virginia Shenandoah National Park license plates. It was an educational tent, but it wasn’t until I looked at the picture later that I noticed the bear paw print, hair, skull, and poop sample on the table. Obviously, I was only focused on the cute life-sized bear. 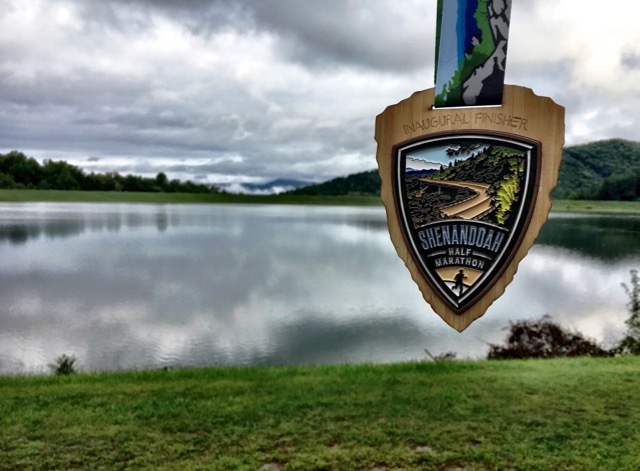 The Shenandoah Half Marathon and all of the other National Park Halves are cup free races. 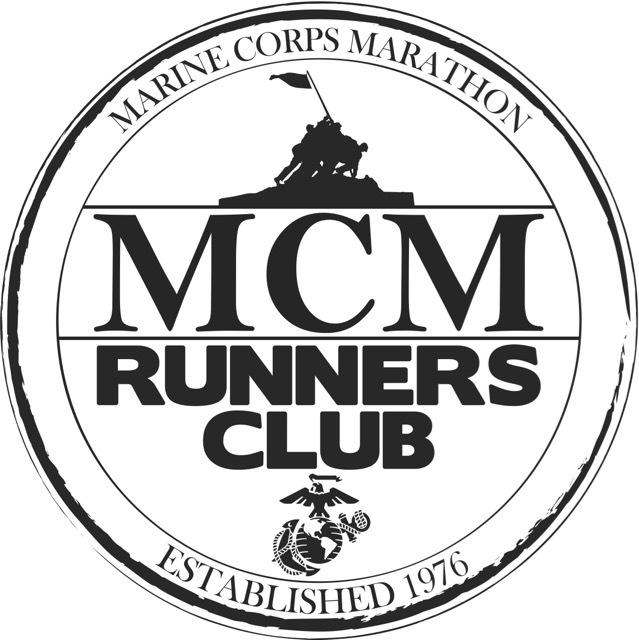 When registering, you are required to check one of three boxes: you agree to bring your own water bottle, use their free hydrapouch, or purchase a water bottle as part of registration. I checked that I’d bring my own, but was curious about what a hydrapouch looked like. 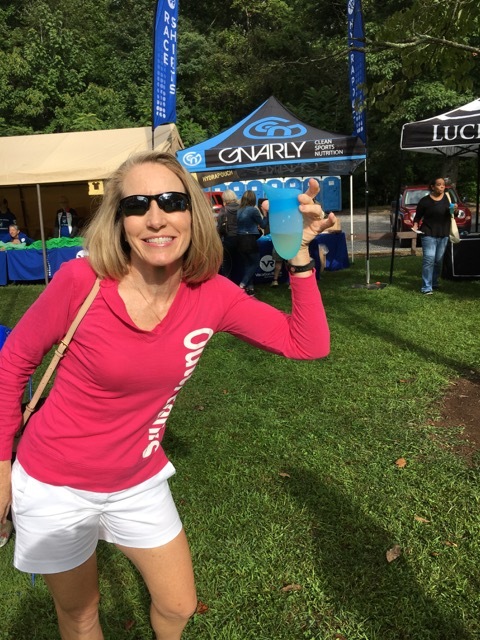 We stopped by the tent and I picked up my free hydrapouch and filled it with a mixture of water and a sample of the sports drink we’d be offered during the race. Once filled, I turned to my friends and asked, “How do I keep the water from bouncing out?” I didn’t realize the hydrapouch was nothing more than a cup to use at the water stations and then clip on your belt to carry when not in use. After leaving the expo, we drove to our hotel, excuse me motel, to check in. Other than the color combinations being hideous, the arms on the upholstered chair being so dirty they were black, and the bathroom smelling like an outdoor damp and musty bathhouse at a campground, it was a wonderful find. I’ll spare you the pictures… Lupe was the smartest one of the three of us, and never stepped on the floor without wearing her soccer sandals. She even wore them in the shower. 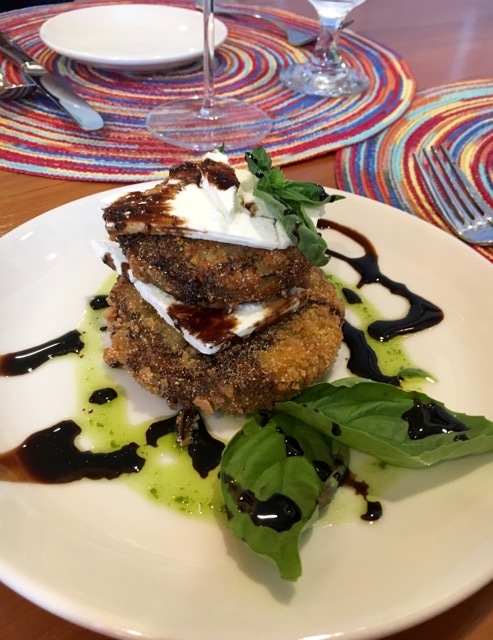 For our pre-race dinner we drove to the delightful Moonshadow Restaurant in downtown Luray where the three of us shared fried green tomatoes for our appetizer. 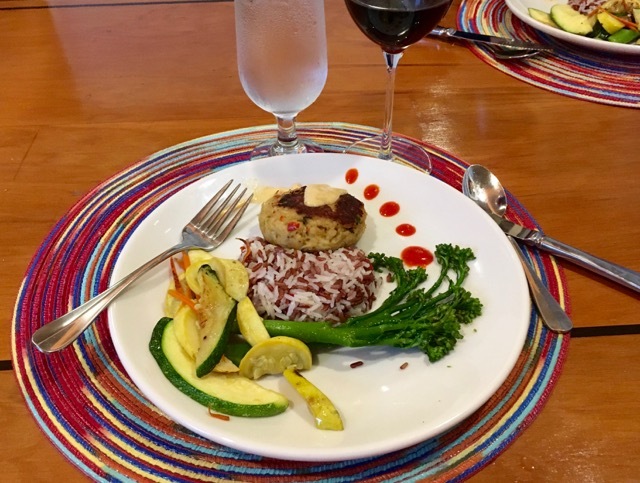 For dinner, I ordered a crab cake with steamed veggies and rice, a pinot noir, and lots of water. Everything was delicious! Back in our room, we stalked the weather some more (we’d been stalking our weather apps all week), and didn’t see a change in the 90% chance of heavy rain and 55° temperatures forecast for the next morning. To add to our delight, we checked out the course elevation map one more time before turning out the lights at 8:15. Our alarm was set for 4 AM and we needed all the sleep we could get. Surprisingly, we all slept pretty well and had no trouble getting up. Once up, dressed, fueled, and bathroomed, we left our room in plenty of time to get to the parking lot by the 5:30 cutoff and catch the race buses to the start. As we stepped outside, we noticed that it wasn’t raining. We had checked doppler radar earlier, and had been shocked that the rain had moved across the Shenandoah Valley quicker than expected and most of it had moved out overnight. There were a few blue spots moving our way that we might have to deal with later, but it was nothing like what we had expected. Instead, we were treated to a pretty consistent temperature of 55° and cloud coverage. Even with some humidity, we had near ideal racing conditions, especially for early September. We parked at the race finish area and caught our big yellow bus for the ride to the race start. We had a delightful driver who tried to point out a few points of interest in the pre-sunrise darkness along the way. Once we arrived at the starting area, we headed straight to the porta potties. With no lines, I handed my stuff to Lupe and Angela to hold and headed in. I’d hardly gotten the door locked when I heard huge rain drops pounding on the porta potty roof. I contemplated staying in the hardly used fresh-smelling restroom where I was dry, and I might have stayed a little longer than usual, but I eventually decided I should venture out to find my friends. Fortunately, I’d brought clear garbage bags for the three of us to wear before the race, so at least our bodies would stay dry. I darted out of the porta potty and headed straight to protection under the eave of a cabin where other runners were standing. Eventually, I went in search of my friends and found them huddled under a tree. Almost as quickly as the rain had started, it stopped, and that was it. The little blue spot on the radar had found us and then moved along. After shedding our jackets and garbage bags and checking our bag, we posed for a pre-race picture. 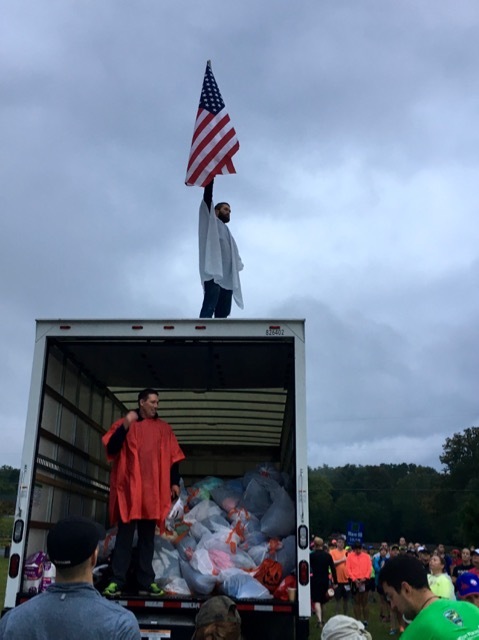 As we turned from our picture, we saw a man climb on top of the bag check truck and hold up an American flag. I snapped a picture, and within moments, a beautiful rendition of the National Anthem began to play. Earlier in the week, on my last day at the beach, I had tweaked my back and wasn’t fully sure I’d be able to finish the race, but by now I was feeling fine and hoped for a successful run. I lined up with my friends in the orange corral with the hopes of running a 2:05 to 2:15 race. We stated together for the first mile or so, and at least long enough for me to capture this picture of the three of us running past a corn field. 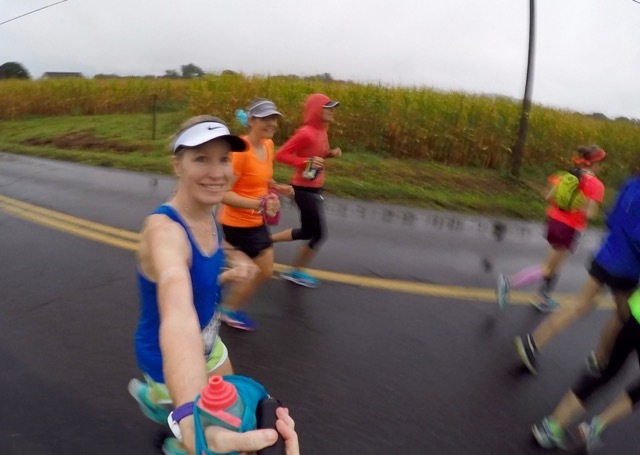 With the overcast sky and occasional light mist, it was tough for me to get good GoPro (affiliate link) pictures while running. After I took this picture, Lupe pulled ahead, but we caught up with her again when we stepped at the first set of porta potties and saw her coming out. 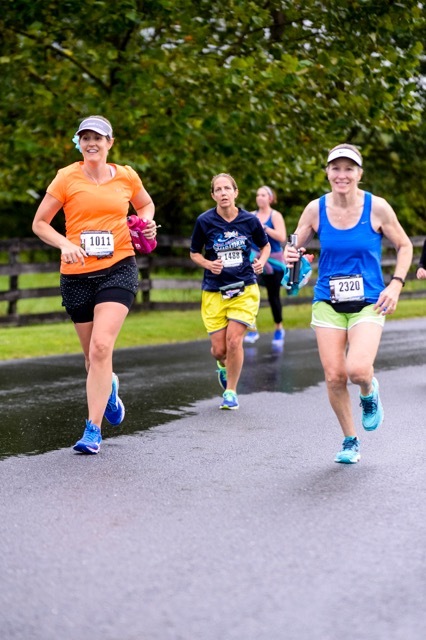 The three of us ran together for a little while longer on a relatively flat portion of the course, but Lupe pulled ahead as soon as we hit our first set of hills and we watched as she pulled farther and farther away. 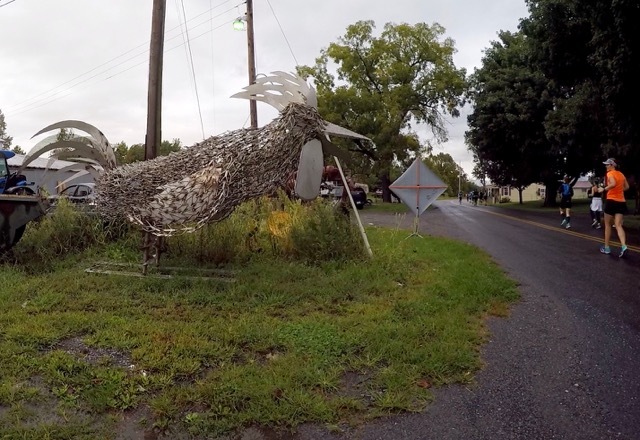 Having driven up and down Interstate-81 hundreds of times while admiring the Blue Ridge Mountains, it was interesting to discover what lay on the other side. 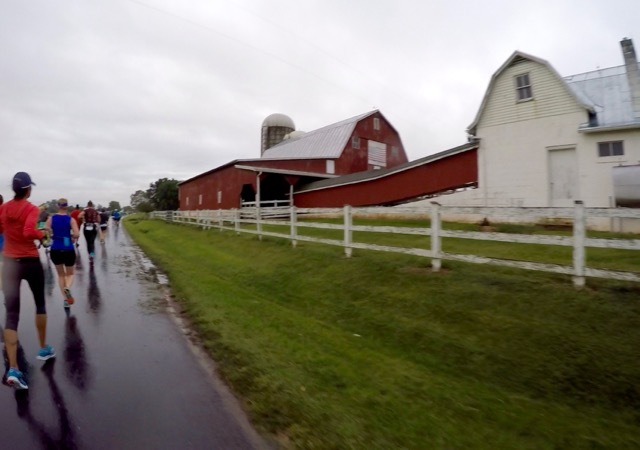 Much like on the interstate side, we ran past farm after farm and were entertained by the antics of cows and horses spooked as we ran past. The photographer caught Angela and me still smiling before we got into the serious hills on the course. 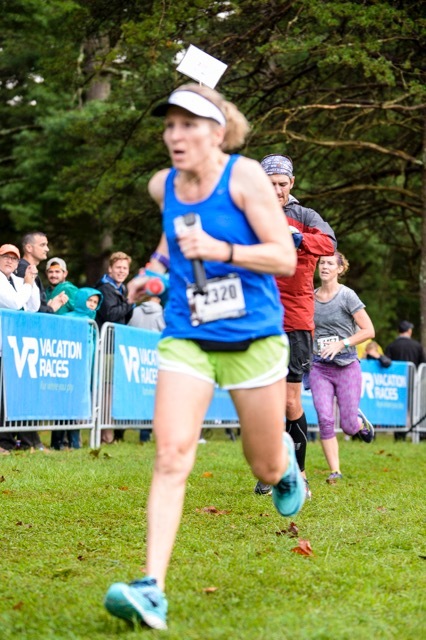 It was the first time in a very long time that I had to pay for my race pictures (most of our local races provide free photos), but I got a significant discount by ordering them early, albeit sight unseen. I plowed up most of the first hill with Angela, but decided I could walk faster than I was running (I really couldn’t) so I slowed to a walk for the last 50 yards or so. It ended up being the only time I walked up a hill during the race because I soon realized that if I walked the hills, I’d be walking much of the race. The next hill was a doozy and I watched Angela pull away as we climbed and climbed. I tried my best to capture the magnitude of the hill, but I’m not sure if this even gives it justice. After cresting the top of the hill, I fell into glide mode and caught up with Angela on the descent. 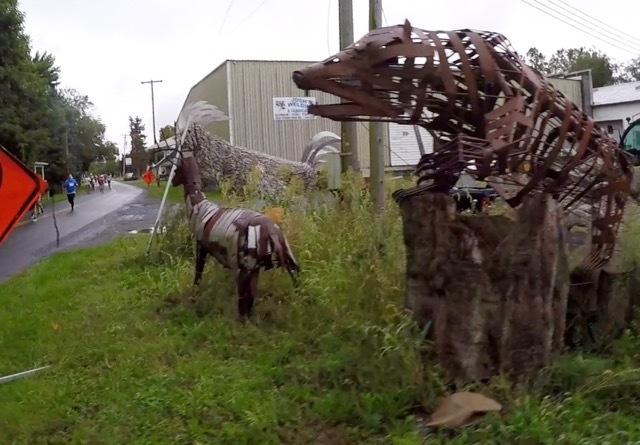 We ran past several animal sculptures and I slowed just long enough to take pictures. Angela and I continued to run together for another half mile until we approached another steep, 2.5-mile long hill. I decided to stop at the porta potty at the base of the hill even though I didn’t really need to, and that minute or so came back to haunt me at the end of the race. As we left the restrooms near mile 9, Angela pulled ahead and I watched her pull away gradually until she was out of sight. Once on the hills, I made a pack with myself to not drop below an 11:00 pace. If I’d done the math correctly in my tired runner’s brain, I’d be able to finish the race in under 2:15:00 if I maintained that pace. Miracle of all miracles, I had a smile on my face when the photographer captured me climbing this hill. The end result is one of my all-time favorite race pictures, making the money I spent to pre-order the race photos worth it. After 2.5 miles of non-stop climbing, I saw a glorious downhill. I relaxed and let my body cruise down as fast as my shot quads would allow. 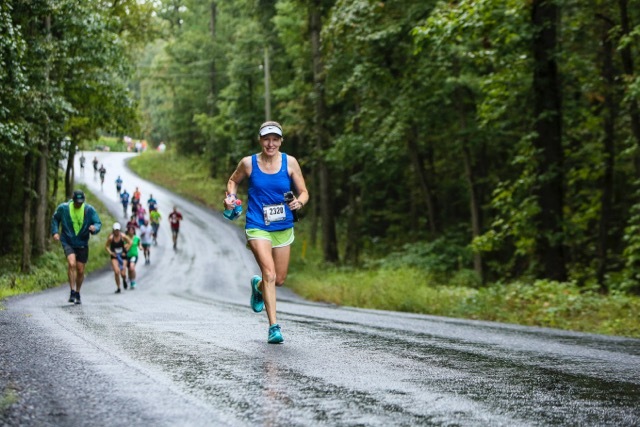 When I ran out of downhill, I pushed as hard as I dared on the flat road with hopes of finishing in under 2:10:00, but afraid at any moment my exhausted body would just refuse to go on. My 13th mile was the fastest of my race, clocking at 8:43. Once we turned off the road and into the park, we were running at times on slippery wet grass and I prayed that my legs wouldn’t go flying out from under me. As we made the final left-hand turn onto the grassy lane leading to the finish line chute, I turned on the jets and finished the race at a 6:45 pace. 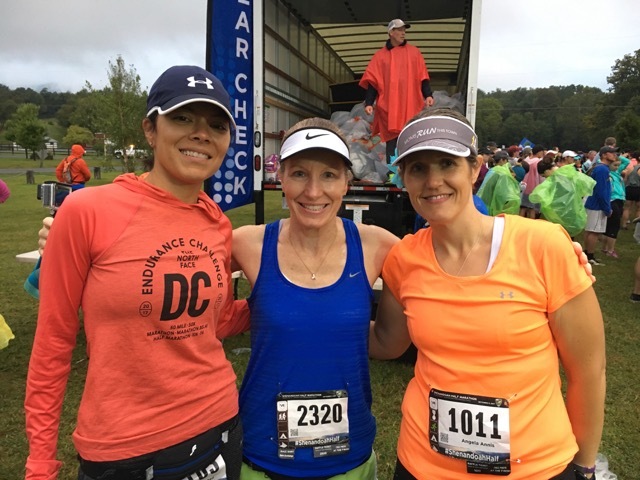 My official race time was 2:10:12 (9:56 pace – 5th out of 32 in my age group), and I realized that the decision to stop at the second porta potty when I didn’t really need to go cost me at least a minute. I was thrilled with my time on a very hilly and difficult course, but would have loved to finish in under 2:10:00. After grabbing our post-race snacks, we got in line for a picture in front of the race sign with the lake and mountains in the background. And before stepping away, I snapped a quick GoPro selfie. Deep in conversation discussing our individual races as we walked back to the car, I almost forgot to pick up my race shirt. Fortunately, we walked right past the shirt tent or I’m sure I would have forgotten it. After quick showers at the motel, we packed up and headed home. Shortly after getting on the road we caught up with the rain; rain that had taunted us all week, yet was considerate enough to move out before the race. The girls and I had a fabulous time and I was still smiling from ear to ear the following day! 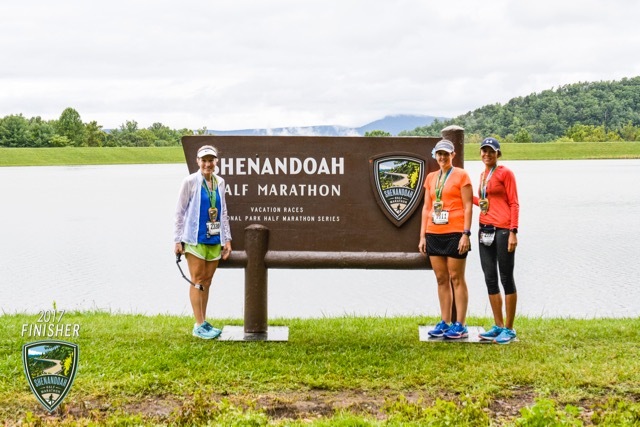 If the Shenandoah Half is a reflection of the other National Parks races, I recommend giving at least one of them a try. 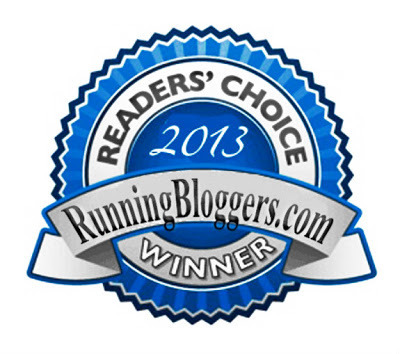 Next on my radar just might be the Grand Tetons Half! 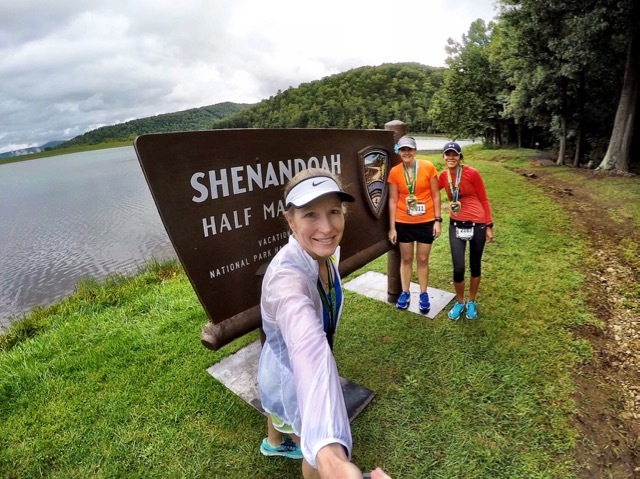 Have you run any of the National Park races? 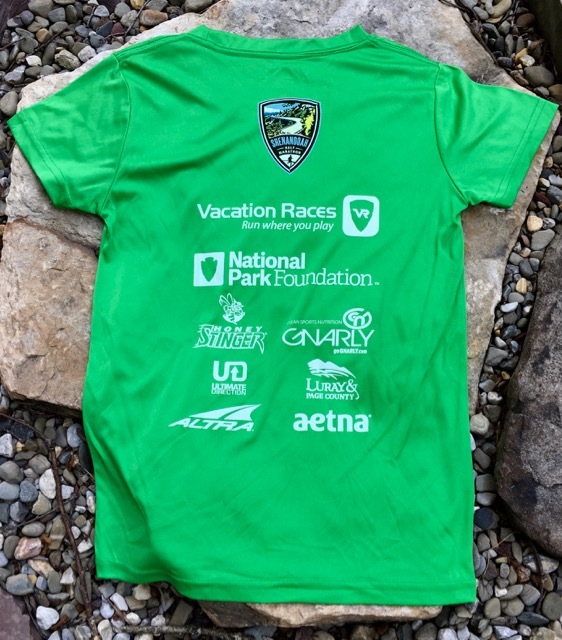 Which National Park race would be your first choice? 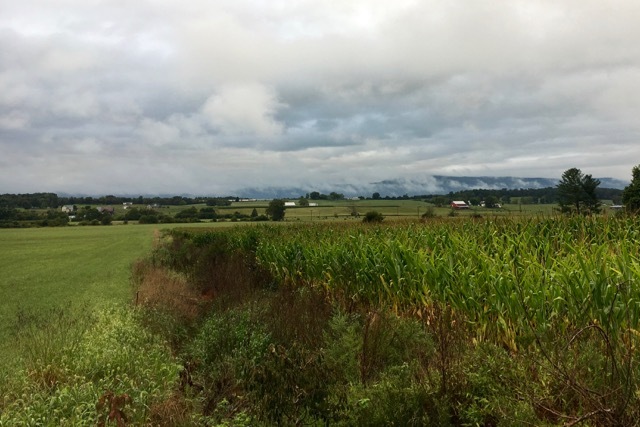 Have you visited Shenandoah National Park or driven on Skyline Drive? Congratulation on your race! Looks like a tough but pretty course. I really like the finishers medal. Glad the rain held off for you. About a week out before a race, I constantly check the weather! 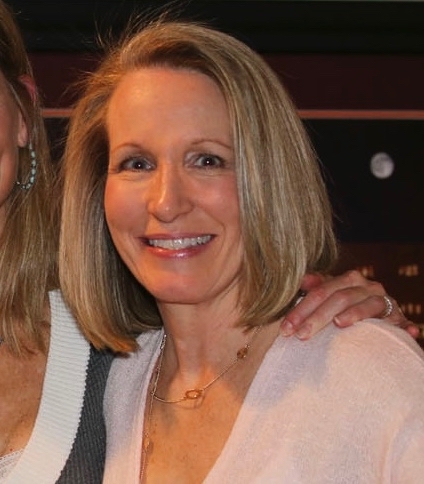 Thank you, Cyndi! Tough, but pretty, is the perfect description of that race course. Great recap. And great race with those hills! LOL on your motel description. Part of the rustic park area experience? Thanks, Coco! I like your “rustic park area” positive spin! That’s your theory and you’re sticking to it! I once ran a marathon with a friend to help pace him, and whenever he’d take a walk break I’d have to keep running because his walking stride was so long. 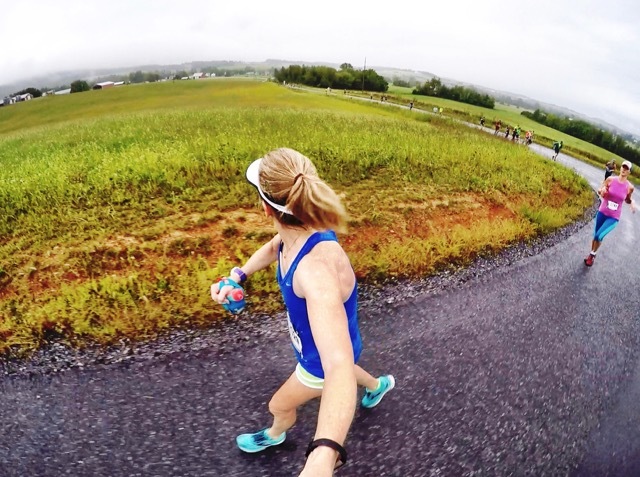 Sounds like you and he would be perfect run/walk partners!